The Advanced Multimedia Outlet (AMO) is a high-capacity, low-profile, multimedia surface housing capable of supporting up to 12 copper/fiber connectors or 24 small form factor LC connectors. The AMO may be used as a Multi-User Telecommunications Outlet Assembly (MUTOA) as specified in TIA/EIA-TSB-75. 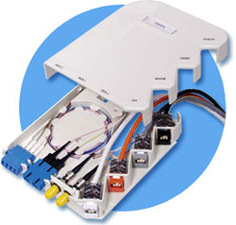 The AMO system provides users the flexibility to configure their unique requirements; connector/adapter brackets, as well as a variety of fiber options including ST-style, SC, LC and MT-RJ formats. 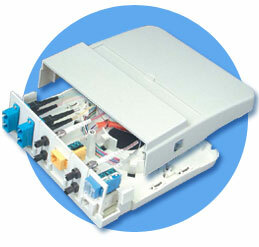 The AMO provides fiber storage supporting up to one meter of buffered fiber. A hidden label field is exposed by lifting the cover, and connections are protected from accidental contact by a shroud. The AMO is Hubbell's largest capacity surface mount housing, accommodating 12 copper or 12/24 fiber connections. Custom configure your required application with these various media brackets. The OFPPL multimedia housing accommodates 2 SC duplex, 6 ST-style or 3 LC Quad adapters. In addition, there are 4 keystone openings for Jacks or SF connectors.